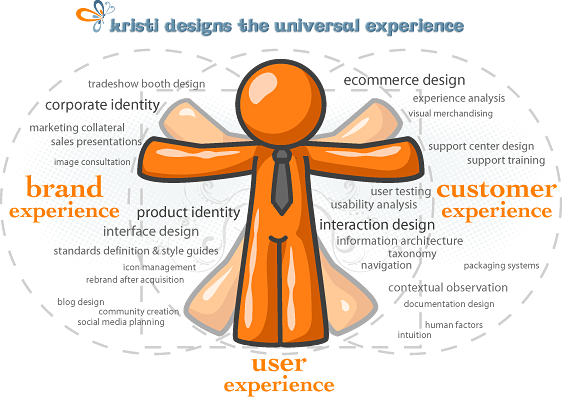 At least three distinct, but related components must work together to create a great user experience… the “brand experience” and the “customer experience” are phrases that may be less used than the term “user experience” but they are indelibly intertwined and must be designed together. A user experience specialist must therefore be able to look at the universal experience from as far away as an astronomer views the galaxy, and then be able to zoom in at a micro level and account for the finest of details, to design and deliver an intentional experience. So what are these three unique design aspects, that in combination, create the feelings, emotions, pleasures and pains that characterize the user’s experience? Visual, verbal and experiential encounters create a brand experience that encompasses a range of intellectual, sensory and emotional connections. User experience encompasses the design approach and validation methods (such as usability testing) that specialists utilize, which impact a user’s perception of a device, system or tangible product. User experience planners aim to affect all aspects of the user’s interaction with the product – how it is perceived, learned, and used. Look through the eyes of the target customer, to see the customer experience, from beginning (before a sale) through usage (using a car, coffeepot or software), to completion (post-sale support, followup, upgrade or product replacement) in order to forge a positive and lasting relationship with your customers. A User Experience Roadmap can help you capture this big picture view, and serve as a tracking mechanism for the many deliverables and details that are necessary in crafting these experiences. The wonderful thing about a roadmap is that it can be as detailed or as brief as necessary, and if used as a living document, will provide service for the life of the product, system or environment it is mapping. Inspired by Wimbledon and a project I heard about recently, I created a sample roadmap for a fictional retailer of tennis apparel and equipment, who want to expand into the world of virtual sales by developing an ecommerce store. They only have one physical location (at the moment) and the company needs a brand upgrade. By necessity, they will need to alter their customer service model, because a virtual store requires a different approach than the traditional brick-and-mortar store offers. When people can buy something 24/7, they can run into issues and the smart (and serious) ecommerce seller will not shirk on the customer service required to support these sales. The reason for adding visuals is quite simply, because they SELL. “A picture paints a thousand words” has proven true in my experience with clients and co-workers. People often need to “see” what they are agreeing to, and if you give them a taste of what you want to do, it helps to engage them and get them excited in a way that no wireframe or functional spec document can ever do. I did not add personas to this fictitious roadmap sample, but there are many specific user types I could add that would help developers understand who they are programming the ecommerce store for – because these users are not likely computer experts, and their ages range from fairly young to very senior. My personal belief is that an effective user experience will create a customer for life (the life of your offering, or the life of the consumer). Your brand and customer experience are critical to the user experience. The roadmap is a great place to document the weaknesses or flaws in the experience – not to be critical, but so you can plan around them. Some of the worst user experiences occur when the user encounters something unpleasant, and the company is completely unaware of the issue. “No surprises!” is always my motto, and that means the roadmap might contain the good, the bad, and the downright ugly aspects so that problems can be identified, remembered and corrected. For example, say you design software and have a known installation issue. You’d like to fix it, but market demands and various other factors conspire against you, and you just can’t get it done in this release. Rather than close your eyes, cross your fingers and hope no one will notice, you can take action to make this negative issue at least a little easier for users to contend with, by dealing with it in ways that don’t involve changing the code. You can write a special notice to be placed inside the packaging, send email to customers with workarounds/special instructions, and train customer support staff so that the minute a user calls with the issue, they know how to handle it, until you can correct it in the next release. It’s also important, and persona development can help with this, to remember that the same person using something, or affected by a brand, is not necessarily the purchaser/customer. For example, a mother might buy her son a tennis outfit designed to minimize perspiration… she may or may not have been attracted by the brand, or he may have told her he loved this clothing – but once the gift is given, the son is the user and will determine the necessity of returning the clothes, recommending them, or becoming a lifelong customer. Your experience design has to take into account all of the possible scenarios and types of people who are affected by your brand, user and customer experiences. Your link to the sample roadmap is not working. Would really love to see it! Links were not working again but they are all fixed now!